How often do we say this to someone who’s upset or to ourselves when we feel nervous? It’s not just an empty statement – our breathing has a big impact on our physical and mental state. 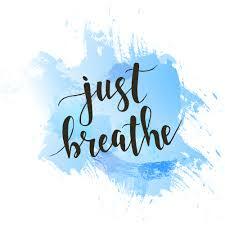 It’s not uncommon for our breathing to speed up and become more shallow when we feel anxious and on edge, and slow, deep breaths send messages to our mind and body to relax and calm down. Our breath is a great wellness tool that is always available and around which we can build some wellness habits. Work on breathing out for as long as you breathe in. Getting air out of your lungs opens them up to take in more air. This is sometimes called “square breathing” – breathing in, holding, breathing out, and holding for the same length of time. A simple but effective trick to practice. Breathe deeply in and out while trying physical movements to relax. Breathe in through your nose while you stretch your arms or legs outward and breathe out through your mouth while you lower them. Or, run your hand up your arm while you breathe in and down your arm while you breathe out. Focus on a still object to reduce stimulation and help you concentrate on your breathing. Try a candle flame, a tree, or a sentimental object. Or, move a smooth stone around in your hand and focus on that. Try visualization. Imagine yourself in a place you find relaxing or picture something you find calming, such as waves on the beach or a tree blowing in the wind. Use words as well, such as thinking to yourself “breathe in the calm, breathe out the stress” or something that is meaningful for you. Go to a different location to relax. Feeling stressed at your desk? Take a walk outside or to a private location to try some breathing techniques. Or set a regular place to do your breathing exercises. Even being in that spot can contribute to calm if you associate it with relaxation. Experiment with some apps. Calm and Headspace are just two excellent ones with tips for meditation and mindfulness that you can practice with your breathing. It was the author Gregory Maguire who wrote, “Remember to breathe. It is after all, the secret of life”, and it can also be part of the secret to relaxation, calm, and wellness. Previous Post: « What’s With “Pill Shaming”?